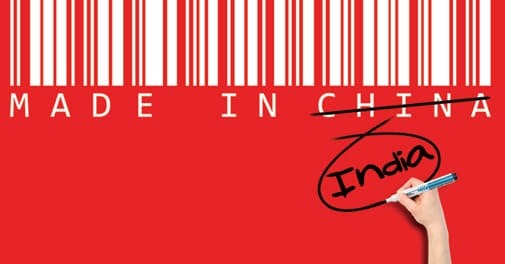 If you live in India and purchase a "Made in China" commodity instead of "Made-in-India" commodity, then your home country loses not only a factory job but also indirectly associated jobs such as in schools, hospitals, and auto sector. Instead your purchase of the imported commodity creates such lost jobs in China." (i) Direct jobs: Employment in manufacturing plant. (ii) Indirect jobs: Employment changes in suppliers and distributors. (iii) Induced jobs: Jobs resulting from direct and indirect employees spending more and increasing consumption. For an example, employees expending creates jobs in industries like auto, housing, school/college and food, i.e. as the employee will rent or buy a home and auto, his children will attend school or college, etc. The government will also be getting taxes from these jobs which would be spent on infrastructure and welfare schemes. There are additional secondary effects by job creation through benefits of improved access to infrastructure, such as access to more reliable power allowing enterprises to produce more, and more efficiently. (2) The second major hidden cost is that when you buy an imported item, it is costing India its hard-earned dollars. In India, people use the Indian rupee when they pay storeowners, who in turn purchase imported items from domestic importers. The importers pay in US dollar when they buy these items in world markets, and these dollars are provided by banks in India that are authorized to do transactions in foreign currencies. Hence, in the end, India has to get these dollars from somewhere, say from the dollars earned by exporters or foreign investors. If India does not have enough dollars to pay for imports, it has to devalue its currency so that exporters can export more. As India imports 70% of its oil and oil is priced in dollars in the world market, the oil price increases in terms of rupee, after devaluation. Whenever there is a price rise in commodities such as petrol, opposition parties and common people blame the government for the price rise, whereas they should blame their own countrymen who are purchasing imported items. Indians, who purchase cheap imported items, do not realize that they are in fact paying much more than the sticker price. Therefore, if we take entire economy into consideration, a 200 rupee tag of a Made-in-India item might be cheaper than 100 rupee rag imported item. Therefore, the Modi government needs to redefine its “Made-in-India” program to consider the above-mentioned facts and also to teach Indians the benefits of purchasing “Made-in-India” items. The government should target imported products that are killing domestic jobs and provide tax-breaks as well as subsidies towards labor cost to manufacture these products, similar to what it does in MGNREGA in rural sector. Rather than allowing profit-oriented large conglomerates to create factories for this purpose, the government should allow only small cooperatives, working on no-profit-no-loss principles, to manufacture these products locally so that more and more jobs are created.